The old and the new – a 1918 Waterloo Boy tractor alongside a 2018 John Deere 9570 RX tracked tractor. 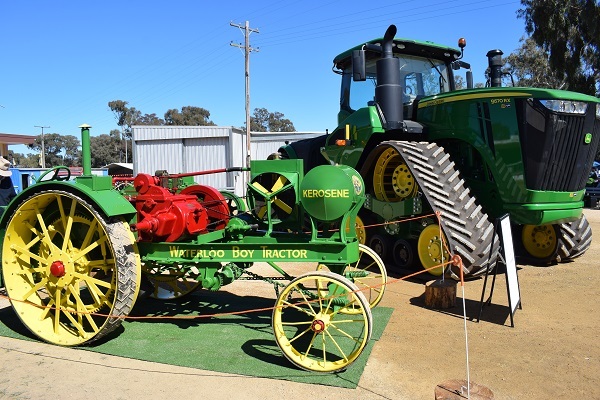 THE revolution in tractor technology that has transformed farming over the past 100 years was captured in striking contrast when the ‘old’ and the ‘new’ lined up side by side at last week’s Henty Machinery Field Days in southern New South Wales. 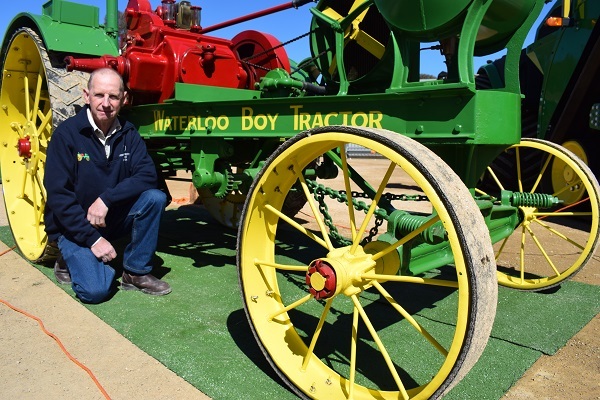 Victorian woolgrower and collector of antique machinery, John Kirkpatrick, Lake Goldsmith, brought along his fully-restored, Waterloo Boy tractor, Number 8901, that had been produced in John Deere’s factory in Waterloo, Iowa, in the United States in April, 1918. Towering alongside it was one of John Deere’s latest creations, a high-tech 9570 RX tracked tractor, that had been produced in the same town a century later. The match-up of a 100-year-old, petrol/kerosene workhorse with one of today’s most sophisticated farming giants provided a graphic comparison of just how far farming technology has advanced since tractor power began to replace the horse a century ago. John Kirkpatrick with his 1918 Waterloo Boy tractor. Mr Kirkpatrick said in its time the Waterloo Boy was a revolutionary machine and the fact it was still operational 100 years later was a testament to its design reliability. After rolling off the production line in Waterloo in 1918, it spent its early working life on the prairies around Winnipeg, Canada, ploughing fields and thrashing chaff. “The early tractors were designed to basically replace horses. It was a big step bringing people away from horses to tractors. With mechanical machines, they were on a very steep learning curve,” he said. The Waterloo Boy has a two-cylinder, horizontal engine and develops 12 horsepower on the drawbar and 24hp on the belt pulley. It initially runs on petrol, but when warmed up can be switched over to kerosene. It has chain steering and one gear forward, one gear in reverse transmission. Slow by today’s standards, it crawls along at a leisurely one to two kilometres an hour. “There is a spring-mounted seat on the back. The air conditioning comes free and won’t break down,” Mr Kirkpatrick said. 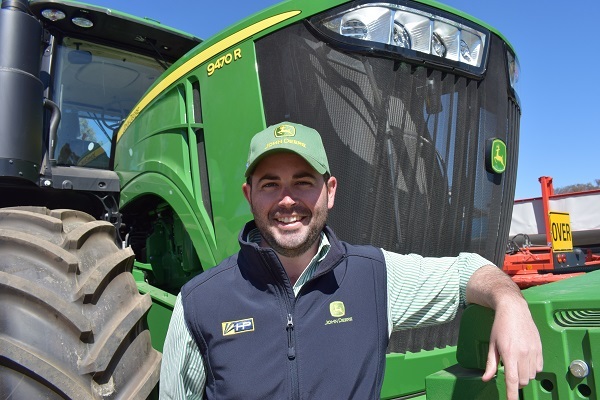 Comparing the old with the new, John Deere sales operations manager, Andrew Watt, Wagga Wagga, NSW, said it was astonishing that the two tractors came out of the same place in Iowa 100 years apart. “It just shows how things have grown with the Waterloo Boy tractor only 24hp compared to our tractors today being up to 620hp coming out of that factory,” he said. Mr Watt said one of the biggest factors allowing the production of higher horsepower tractors had been the development of high pressure, common rail diesel engines. “It allows us to inject the diesel at a lot higher pressure which makes it atomise a lot better and create a more efficient burn and more power for the burn. That gives more bang for your buck,” he said. “Adding to that, the ability to add in turbo chargers, forced air induction and inter-coolers allows us to run cooler air which gives you more horsepower. Mr Watt said one of the most significant advances had been the adoption of sophisticated, high-tech guidance and control systems. “Tractors can now drive themselves in a straight line, they turn around at the corners by themselves, they will take the implement out of the ground, turn things on and off, change the ground speed, turn the diff lock on and off, all automatically, and do it all in reverse when the implement goes back into the ground at the end of the turn,” he said. Mr Watt said the development of the modern-day tractor had brought with it extraordinary advances in efficiency and capability. “One tractor can now get over 10,000-20,000 hectares by itself in a year versus the Waterloo Boy which would have only been able to do 100 acres. The productivity now is amazing,” he said. Looking ahead, Mr Watt said the focus of machinery development would be on automation and precision applications. “There is a lot of talk about ‘swarm’ farming and having robots doing the work more often, but in a smaller fashion. We won’t see tractors becoming larger in size,” he said. “I think we will end up with smarter, more efficient, more productive machines and more automation which will drive a lot of productivity gains.